Cheers to a new week! I enjoyed my weekend, as it was the first weekend in a loooong time without grading. But of course, I also knew that I would be getting a hugggeeee stack of papers this week. Well, now I'm off to show you the latest offering from Alter Ego for Polish Pickup. What's funny is I literally saw the Macarena video on MTV classic the other week. And ya, I did the whole dance in my bedroom. Tonight, The Simpsons will officially be the television show with the most episodes! A few years back, I did a Simpsons manicure for the Every Simpsons Ever marathon and decided to redo the look for tonight! I would say that these are definitely recognizable! My boyfriend is a huge fan of The Simpsons and has been for his whole life. I just did these today and he loves them! I'm here with May's Polish Pickup, the first of a few! The theme is 90s and I can't say no to that. I'm already seeing that there are tons of nostalgic polishes, being inspired by things that I loved growing up! KBShimmer was inspired by Office Space. If you haven't seen that movie, once you finish reading my post, go ahead and watch it! As promised, I'm back with some art with the four Dip into Pretty polishes I received. If there ever were a more girly look, then I don't know! But I know these were awesome based on how many comments I received. I love taking a chance to see if a polish will stamp, and I was happily surprised! April Pusheen! I remember last year's Pusheen unicorn, since I saved it for Jen's birthday from My Nail Polish Obsession. This month was hard, so please give me some slack! Pusheen and her sister Stormy are riding the most epic bicycle, and I tried! LOL. Good morning! I come to you with a super special post that you better not sit on as there are SINGLE DIGITS of this set left! That's how limited it is! It was my most amazing friend Jen's birthday 2 days ago and for her birthday AND blogiversary, she teamed up with Pam at Stella Chroma to create this exclusive set. I, of course, wanted Jen to share the set and give her a few days to share it. Who knew it would basically sell out in two days haha, so here I am, telling you to rush!! Please check out Jen's post on it HERE! Hi all! Hope you had a lovely weekend. Finally, we have 60 degree weather, although it still drops to like 40 degrees. I feel like spring is almost here. So with this ridiculous weather, I've had to up my moisturizing and beauty care. I tend to be really affected by weather changes, and I've relied on some KBShimmer staples! Once I received the other half of the Morgan Taylor Platinum Holos, I knew I wanted to do art with them! I attempted a super duper failed nail art a few days prior, so I had to set these down haha. So I finally came back to them and I went with simple stripes! Good Morning! Today I have a huge post with the newest lipstick releases from Julie G! They have 12 new lipsticks and 8 new Glow Stix! There's definitely something for everyone with these releases, and I'm a huge lipstick fan! Did you all have crazy rain storms today? We did and it came down hard! Anyway, I spent an hour on nail art last week. An hour. And guess what? I hated it. I didn't even take pictures of it because it made me rage. So I removed it immediately and noticed I didn't put away some glitters and flakes from Born Pretty yet and decided, LET'S THROW THEM ALL TOGETHER and that's how this mani came to be. 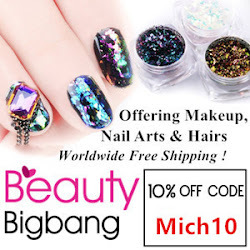 So I'm back today with more Beauty Big Bang polishes, that are totally normal smelling, LOL. I was actually sent four of these holos, but two were the same color. There's a student worker who asked me about whether or not I knew about holos and that she saw pics of it...so cute. So she received the extra blue holo! Hahaha! If you're looking for POP WOW HOLOGRAPHIC POLISH, these are for you! Happy Hump Day! Today I'm sharing a new-to-me brand, that specializes in pedicure separators and now have a new polish line! They even have adorable gift sets of coordinating polish colors and pedi separators. I have four of their new colors to share with you today, and I definitely think a large audience will enjoy these colors. Hello All! I have a simple nail art for tonight. I love leopard nail art and doing it in unconventional colors is even more fun! I am just loving the Lechat English Rose collection so I continued to use it. I promise, I'll move on and try other colors hahaha. Hello All! I was super excited when the second half of the Morgan Taylor Platinum Holos showed up last week! There was a super sunny day and I finally had a free moment, so I wanted to get these photos to you. I posted the first half HERE on February 19th. The other half took a while to get to me, but now I have a reunited family of gorgeous holos LOL. I'm back with more Girly Bits gorgeousness! I wanted to share the newest Colours of the Month duo, since you have a few more days with the special pricing! You are going to want these colors, so you may as well get them when you can get the special pricing. The springy duo is reminding me that it's almost here, despite the snow this week. Doesn't matter, cause with these on my nails, I feel good. Good evening! Are you ready to stroll into the weekend like I am? So if you haven't heard, Hella Holo Customs is now Hella Handmade Creations. This new concept will allow makers to choose a theme and make polishes, once a month, based of their theme. 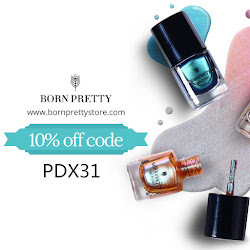 You can purchase the polishes through an open site, for one week, to anyone. Girly Bits has chosen Harry Potter as her theme, and is starting off with a boom with a gorgeous red! Cats and rainbows. To me, that's always a sensible combination. I've had this stamping plate for a while and was finally excited to get a moment to finally use it! I love these ridiculous plates! They are low cost, so even if you won't reach for it everyday, you are getting your money's worth. These are just so cute! I have one more Polish Pickup to share before it goes live this Friday. I am really surprised with how fun the makers got with this theme. I fully expected a bunch of blurples, and I don't think I've seen any, or very few. 6 Harts went totally outside the spectrum, giving a vintage and dainty look. Dusty colors are my jam, so let's get to it! Good evening! I actually did these nails on Saturday and fully intended on posting them, but decided I needed the weekend off. I'm actually still wearing these! I was actually incredibly fickle on what I wanted to wear on my nails and so I went with an easy go to. Is it my best art ever? Nope. Do I like them? Yea, sure. Are my nails too long? Maybe. I have already filed them down like 6 days ago, and then are just growing like mad. When they break, I'll be sure to complain on here lol.